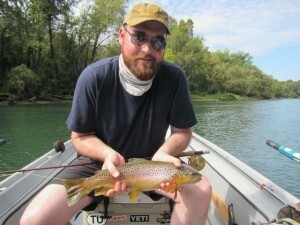 We literally get fly fishing clients that come to our beautiful north Arkansas rivers from all over the world. Our latest international clients were from Shanghai, China. Actually Hammas is from Arkansas, but he has travelled all over the world and is currently working in Shanghai, China. On the other hand his girl friend, Shelley, is a Chinese national and born in Shanghai, China. 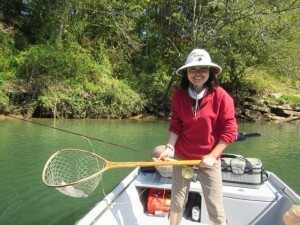 This is her first trip to the United States and as well her first experience with fly fishing which according to Shelley is really not a method of fishing in her country. Shelly obviously speaks Mandarin but she also speaks perfect English as well as Spanish. She is a delightful young lady and runs her own company that develops apps for various mobile devices. 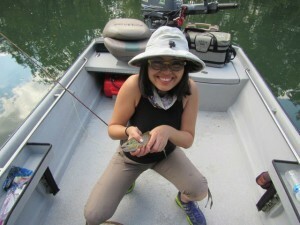 It really did not take too long for Shelley to get hooked up to her first trout on a fly rod. 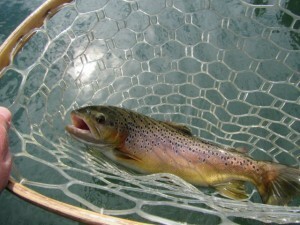 She caught a number a Rainbows and even a nice little Brown Trout. Hammas grew up fly fishing in Arkansas and honed his fly fishing skills all over the world. He managed to land a beautifully slot Brown Trout on Born’s Hairy Legged Sowbug which was the top producing fly of the day. We all enjoyed a delicious lunch on the river bank and really had a wonderful day with near perfect Arkansas fall weather. As you might expect there were some discussions about our different cultures and of course politics. It was interesting that Shelley said that most Chinese really do not pay much attention to politics or their national leaders because they cannot vote so they just sort of ignore their government. Perhaps if some of the world leaders would just take a little time and go fly fishing together the world would be a better place!